Future/Perfect, a contemporary, progressive and fascinating performance art and installation will make its Asian Premiere today from 7pm to 9pm at the Raffles Arcade Courtyard at Raffles Hotel. Actress Wong Li-Lin will star as the muse. Future/Perfect is a social experiment that aims to illustrate the new dynamics in which society exists online and how much of this thinking is shaped by the fascination of ‘viewing’ and voyerurism. The show is a unique movement between art, technology and performance simultaneously in motion where one’s life, and intimate behaviour and actions are no longer private. Future/Perfect is produced by Elizabeth Lazan in collaboration with Tara Subkoff and is supported by National Arts Council and Chan Hampe Galleries. Tara Subkoff is an American artist, actress and fashion designer. Tara has acted in over 30 films and owns a contemporary fashion label, Imitation of Chris. Tara has showcased her works at the Paris Couture Shows and also created a ten day installation and continuous performance piece at the Carlton Festival of the Arts in Sao Paulo, Brazil. The performance will take place in a glass house ‘cube’, composed of new and recycled plexiglass, designed and sculptured by glass artist Ivan Lee Mora. The glass house will encase Li Lin and her only access for communication to the ‘outside world’ such as a smartphone, laptop and tablet. Li-Lin will practise pilates and her self-crafted fitness regime during the performance. 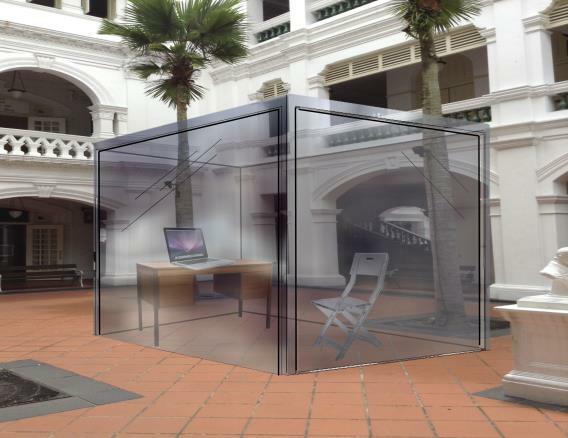 The glass installation is displayed from 23 to 25 October 2013 at the Raffles Arcade Courtyard and a film screening of Future/Perfect takes place on the evening of 25 October as part of the larger Soiree Activities at Raffles Arcade.